As a member of your local food co-op, you appreciate the difference your co-op makes in your community. And as part of our celebrations of the Co-operative Decade, the Neighboring Food Co-op Association (NFCA) is spreading the word about other co-ops in our region and how they help build a better world. 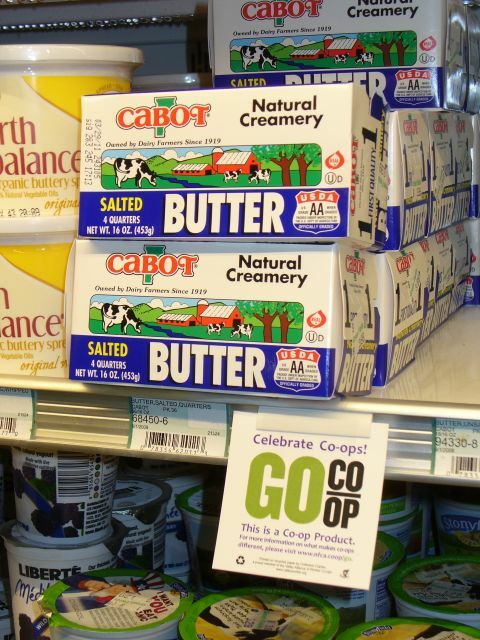 For example, Cabot Creamery Co-op of Vermont has been in operation since 1919. Owned by the 1,200 farm families of its parent co-op Agri-Mark, Cabot operates four creameries — two in Vermont, one in New York and one in Massachusetts. As one of our region’s best known and most-awarded co-operative brands, Cabot has been honored an unprecedented three times at the World Championship Cheese Contests as makers of “The World’s Best Cheddar.” Today, this regional co-op offers a full line of dairy products including cheese, butter, sour cream, cottage cheese and yogurt. More recently, the co-op worked with the Cellars at Jasper Hill to create “Cabot Clothbound,” a natural-rinded traditional cheddar that is aged a minimum of 10 months. This delicious cheese was featured during Co-op Month in 2011 as part of the NFCA’s Cave to Co-op program that offers regional artisan cheeses at an affordable price. Underlying Cabot’s business success is its commitment to initiating marketing programs among different co-op sectors such as food co-ops, credit unions and energy co-ops. Community, democracy and local ownership are integral to the co-operative business model — service to, and for, the communities in which members live, work and shop. In this spirit, Cabot works with the NFCA and other partners in the region to grow the wider co-operative movement. For example, a generous contribution from Cabot that helped launch the Cooperative Fund of New England’s Cooperative Capital Fund, a source of patient capital for co-op development. And on a national level, Cabot helped launch a new website, www.go.coop, to serve as a gateway to the wider co-operative community. Visitors to the site can find resources on different kinds of co-ops, a video on the movement, and testimonials from co-op leaders. Cabot believes in educating others, especially young people, about the value of co-operatives. “The biggest priority for co-ops has to be educating the next generation about the value of co-ops and the power generated by this most democratic form of business,” says Roberta MacDonald, Cabot’s Senior VP for Marketing. To that end, Cabot co-sponsored the “Co-ops for Community” Girl Scout Patch booklet in partnership with the National Cooperative Business Association. The booklet’s activities help girls and young people become more business savvy, understand how co-ops contribute to the communities they serve, and develop business leadership by learning how to form their own co-ops.